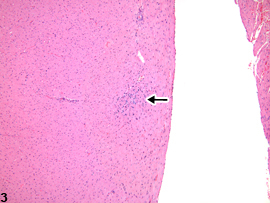 Heart - Cardiomyopathy in a male B6C3F1/N mouse from a chronic study. 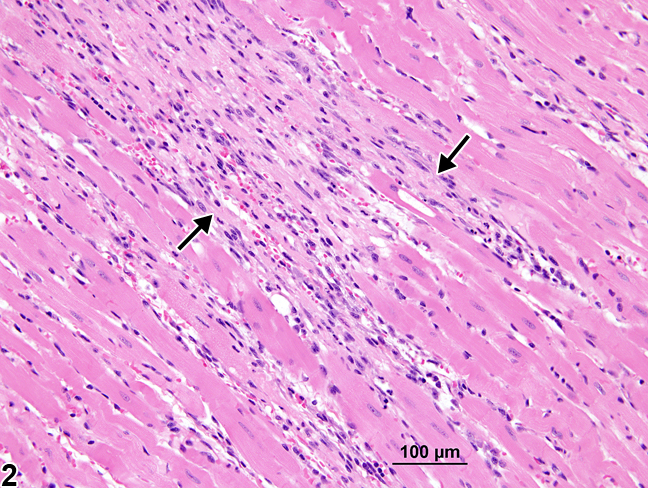 Branching bands of fibrous tissue and mononuclear inflammatory cells (arrows) separate cardiomyocytes. 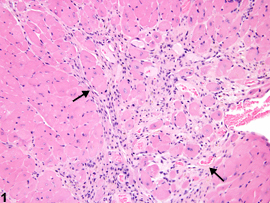 Heart - Cardiomyopathy in a female Harlan Sprague-Dawley rat from a chronic study. 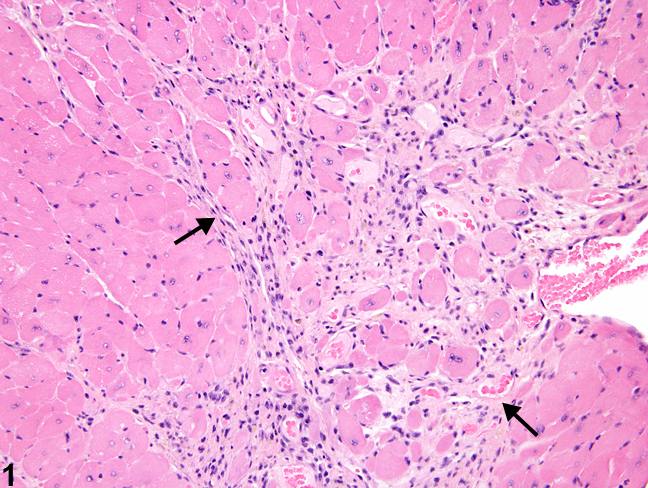 Note the large bands of fibrosis (arrows) and inflammatory cell infiltrates with loss of cardiomyocytes. 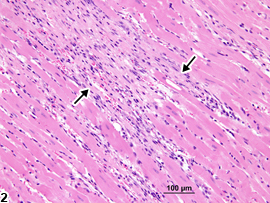 Heart - Cardiomyopathy in a female F344/N rat from a subchronic study. 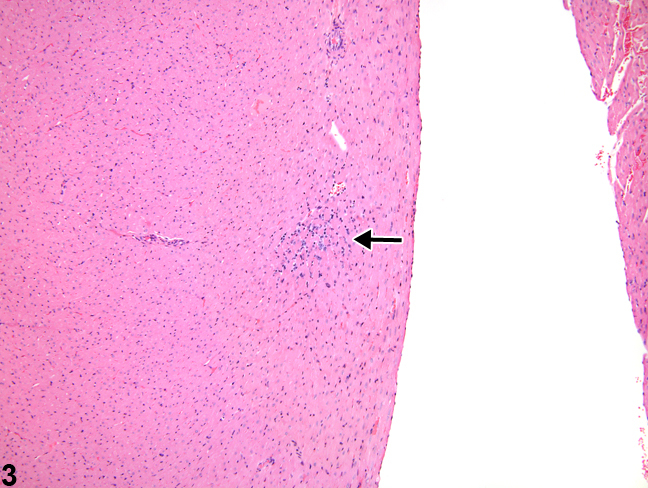 This early lesion is composed primarily of inflammatory cells (arrow). 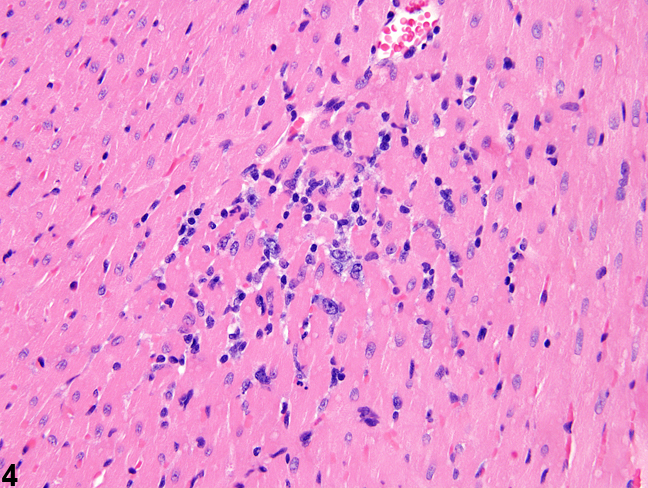 Heart- Cardiomyopathy in a female F344/N rat from a subchronic study (higher magnification of Figure 3). This lesion is composed mainly of mononuclear inflammatory cells. cardiomyocytes and myofiber vacuolation. These changes are often accompanied by a mixed inflammatory cell infiltrate (i.e., mononuclear and polymorphonuclear cells) that progresses to mixed mononuclear inflammatory cells only (i.e., lymphocytes and macrophages). In later stages, there is gradual replacement by fibroplasia. When cardiomyopathy is spontaneous in origin, there is time-related progression in severity (i.e., increase in size and number of foci). Cardiomyopathy occurs more commonly in the rat than in the mouse, and in the rat more commonly in males. Lesions of cardiomyopathy are more frequently found in the left than in the right ventricle and in subendocardial than in subepicardial locations. The apex is more commonly affected than the base of the heart. The prominent inflammatory cell infiltrate seen in degenerative foci in rats is not seen in mice. Early lesions of murine progressive cardiomyopathy typically consist of multiple foci of slight increases in the interstitial cell component. Cardiomyopathy in mice appears to affect individual myocardial fibers, as affected fibers are commonly singly admixed with unaffected fibers. This appearance is in contrast to that in rats, where focal or locally extensive clusters of myocardial fibers are affected. 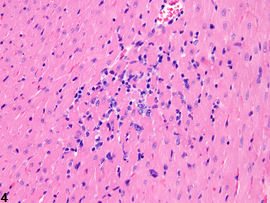 Myocardial cells react to toxic agents in a limited number of ways, and the basic pattern of lesion development is comparable to that seen in spontaneous cardiomyopathy (i.e., vacuolation, necrosis, inflammatory cell infiltration, and fibrosis). In addition, once lesions have healed by fibrosis, they have the same appearance regardless of whether they are spontaneous or treatment induced. Heart - Cardiomyopathy should be diagnosed and assigned a severity grade whenever present. The distribution of lesions (i.e., focal, multifocal, or diffuse), as well as the location (i.e., right ventricle, left ventricle, or interventricular wall) should be described in the narrative. If a treatment-related effect is suspected, it may be warranted to record the individual lesions separately; however, the NTP pathologist must be consulted prior to using such an approach.